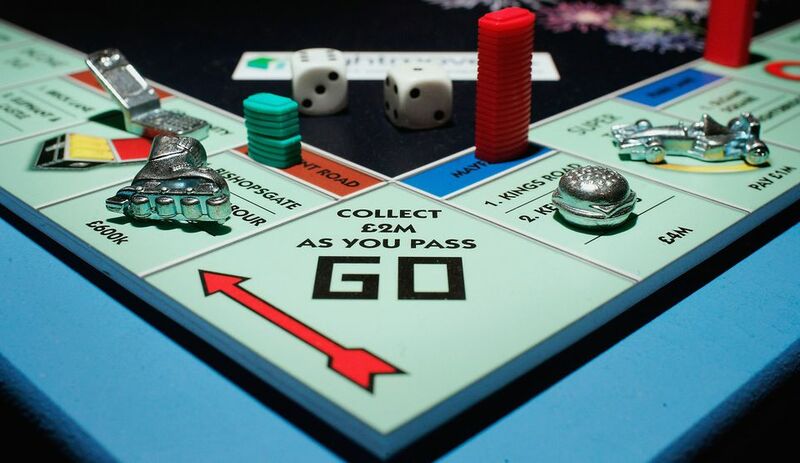 While the Monopoly board game originated in the US, the London Monopoly board is world famous. If you are in London and interested in viewing the board game locations in person, you are in luck because they are only a bus stop away! No booking is required - these are standard public transport bus routes - and, of course, you can get on and off as often as you like along each of the routes as long as you have an Oyster card, a Travelcard or a Contactless card. Even if you have a Pay As You Go Oyster card it will 'cap' (stop charging more) when you reach the equivalent cost of a one-day travelcard so it doesn't matter if you do 4 or 40 bus journeys on the same day. Do note, you can no longer pay cash on London buses. Journey time: 45 minutes approx. Why start here? Because London Marylebone Train Station has Monopoly-themed toilets! After using the facilities catch the 205 bus from right outside the main entrance. You are not getting on the bus at the start of its route (it starts from Paddington) so there may well already be passengers on board but, if you can, get an upstairs front seat as it's always more fun to watch the route from there. OK, Marylebone Station should now be ticked off your list. The route passes Madame Tussauds London, on your left, and when you pass Great Portland Street tube station, on your right, after about 5 minutes, the bus is then on Euston Road. The bus passes The Wellcome Collection on your right and The British Library on your left before reaching King's Cross Station after about another 15 minutes. The bus continues up Pentonville Road to The Angel Islington (another 10 minutes). It goes towards The City, and after a brief look at the street art in Shoreditch, still from the bus, it reaches Liverpool Street Station. You could go to Spitalfields Market, visit Dennis Severs' House, see the Charnel House, have a drink at The Golden Heart Pub, The Ten Bells pub or The Water Poet, have chips at Poppies, see contemporary art at Raven Row, or try a self-guided street art tour. Journey time: 25 minutes approx. You are not getting on the bus at the start of its route (it starts from Shoreditch High Street Station) so there may well already be passengers onboard but that's only a couple of stops away so you could walk back to the start if you can't get that upstairs front seat where we all like to watch from. OK, Liverpool Street Station should now be ticked off your list. Within a minute or so the route passes Heron Tower (a very tall tower on your left). Look at the Reception to see an enormous fish tank. It's actually the largest privately owned aquarium in Europe. After about 5 minutes Aldgate East tube station will be on your left (the nearest bus stop name is: St Botolph Street). Look straight ahead and Whitechapel Road is up there. Stay on the bus and you can enjoy the thrill of going over Tower Bridge. It's great for taking photos of the bridge, the Tower of London, and the river views in both directions. Bonus: Finding free parking for cars may be hard in central London but the City of London does offer free off-street parking for motorbikes and you'll pass near a few of those car parks so can tick off Free Parking. Bonus: The glass egg-shaped building, on the south side of The Thames, opposite the Tower of London, is City Hall - the Mayor of London's offices - so let's have this as Community Chest. Get off the bus at the Humphrey Street bus stop and the major dual carriageway to cross is Old Kent Road. Not much really but you could go into Burgess Park which sprawls across 56 hectares and has plenty of green space and a large lake. Journey time: 20 minutes approx. If you are catching this bus after getting off the second bus you need to cross Old Kent Road at the traffic lights to the entrance of Burgess Park. Turn right and cross Shorncliffe Road then the Dunton Road bus stop is just ahead. As before, you are not getting on the bus at the start of its route (it starts from Brockley Rise in southeast London) so there may well already be passengers onboard which means you might not get the prime viewing seats upstairs at the front of the bus. Don't worry as you are not on this bus for long or could move later. OK, Old Kent Road should now be ticked off your list. After passing Elephant & Castle, the bus soon reaches Waterloo Bridge where you'll get some great views of London looking west, towards the London Eye and the Houses of Parliament, and towards the east, The City and St Paul's Cathedral. Bonus: You can now tick off Water Works here (The Thames) and if you look to your right, just as the bus gets to the far side of Waterloo Bridge you can see Tate Modern (a former power station) so that can be The Electric Company. And once over Waterloo Bridge, the large building on your right is Somerset House which was once a Tax Office so tick off Income Tax too. The bus goes around Aldwych and passes the Royal Courts of Justice, on your left, before entering The City of London and going down Fleet Street. Get off the bus at Fetter Lane bus stop. Plenty. Look straight ahead and you can see one of London's protected views of St Paul's. You could visit St Paul's, or go for a drink - and maybe a pub pie - at the Cheshire Cheese pub or The Tipperary or the Old Bank of England pub, visit the City of London Gin Distillery or see the Whitefriars Crypt, or buy tea at The Twinings Shop & Museum. There are lots of free things to do in the city of London and you can easily see historical London for free. Journey time: 40 minutes approx. If you are catching this bus after getting off the third bus you need to cross Fleet Street at the traffic lights to the Fetter Lane bus stop on the other side of the road. As before, you are not getting on the bus at the start of its route (it starts from Liverpool Street Station) so there may well already be passengers onboard which means you might not get the prime viewing seats upstairs at the front of the bus. Don't worry as you are on this one for a while so could move later. OK, Fleet Street should now be ticked off your list. Within 5 minutes you'll pass Somerset House (listen out for the bus stop announcements) and then to your left is Waterloo Bridge and Wellington Street is to your right. Look up Wellington Street as that turns into Bow Street. The bus is now on Strand and within 5 minutes you'll reach the Charing Cross Station bus stop. You are going to need to be looking quickly to tick the next few off so here we go. Trafalgar Square is straight ahead, slightly to your right. As the bus goes around Trafalgar Square the first left is Northumberland Avenue and the second left is Whitehall - that's the more interesting road to look down as you can see Big Ben at the other end. The bus comes off Trafalgar Square at Cockspur Street which joins Pall Mall. The bus then turns right into Waterloo Place, by the Crimean War Memorial. From here it's straight up to Piccadilly Circus where you could get off to see some of the Monopoly board locations or just let me tell you what's in the area. Once you reach Piccadilly Circus, look right and that's Coventry Street leading to Leicester Square. The bus turns onto Regent Street (it was technically on Regent Street after Waterloo Place but this is the main stretch of the street) and after the Piccadilly Circus bus stop, you'll see Swallow Street on your left. Just off this small street is Vine Street and it's really not worth getting off the bus to see. After Hamleys toy store looks to your right for Great Marlborough Street. Bonus: If you got off the bus you could visit The Courthouse Hotel which was once a Magistrate's Court and two of the holding cells have been preserved in the bar. There were trials held here for Oscar Wilde, Mick Jagger, and John Lennon so you could pop inside, get a drink, and Go to Jail (or you could count the Tower of London from the last bus route as a Jail). The bus turns left onto Oxford Street which is nearly always thronged with shoppers. You'll soon pass Bond Street, on your left, and then look down any street on your left as that's Mayfair. Get off at the Marble Arch Station bus stop and Park Lane is the dual carriage on the left at Marble Arch (the end of Oxford Street). And there you go, you've ticked off all of the London Monopoly board locations!